One of the best-known pioneers of modernism is undoubtedly Vincent van Gogh. This master of color and a genuine innovator produced an impeccable oeuvre, yet he suffered greatly and certain paintings can reveal much about his state of mind and in general his personality. An iconic painting which embodies both the artist’s torment and a need to distance himself from reality through contemplation is The Starry Night from 1889. Although a commonplace, it is necessary to point out again that van Gogh was not a successful artist during his lifetime, and was often perceived as a lunatic. He struggled with poverty and the inability to obtain what he desired the most – a solid artistic career. Drained off the constant misery, in late 1888 the artist suffered from breakdown and cut off his left ear. A couple of months later he decided to voluntarily join the Saint-Paul-de-Mausole asylum, which was located in a former monastery where this outstanding and multilayered work was made one year prior to his suicide and marks what turned out to be perhaps his darkest period. The Starry Night was acquired through the Lillie P. Bliss Bequest and since 1941 has been part of the permanent collection of the Museum of Modern Art (MoMA) in New York. Through the years, the painting was interpreted by various scholars and is still considered as one of the most relevant masterpieces in the Western history. 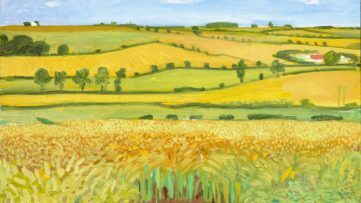 Through the iron-barred window, I can make out a square of wheat in an enclosure, above which in the morning I see the sunrise in its glory. Van Gogh painted the view before sunrise from the east-facing window of his room at the sanatorium, so an apparent fascination with the nocturnal present in The Starry Night is an effect of van Gogh’s state and a search for a different kind of order. Therefore, it can be said that this apocalyptic composition reflects his inner struggle to survive. Every element is involved in an enormous cosmic fusion, except for the village in the foreground with its architectural elements. The impression is that van Gogh was contemplating a different dimension somewhere after death void of any romantic or religious context. The main curiosity surrounding this iconic painting is that the artist displayed different times of day and different weather conditions such as moonrise, sunrise, overcast days, windy days and a rainy day. Van Gogh usually made ink sketches on paper in his bedroom, since the hospital stuff banned him from doing it elsewhere. The unifying pictorial element of all those preparation works is the diagonal line coming from the right which lines the grandiose hills of the Alpilles mountains. Interestingly so, the cypress trees are represented in fifteen of the twenty-one versions beyond the wall enclosing the wheat field. The artist meticulously depicted the view in six of these works by bringing the trees closer to the picture plane. 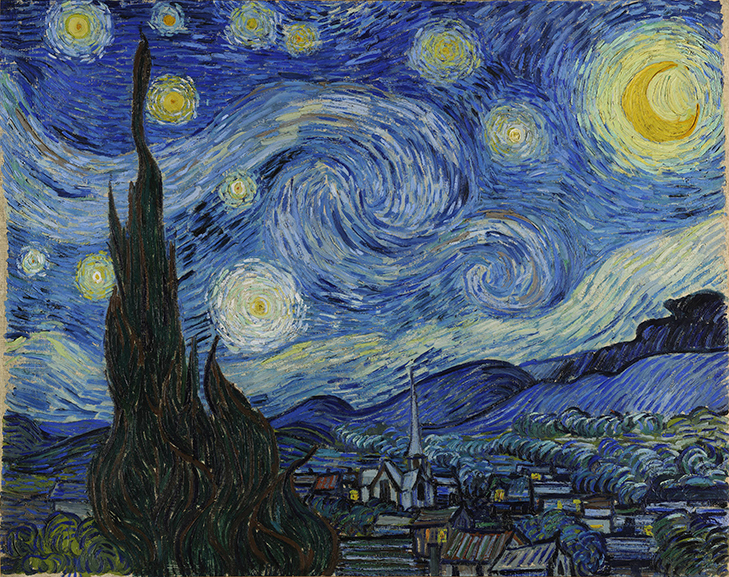 Van Gogh wrote a number of letters, yet he barely mentioned The Starry Night. As a matter of fact, van Gogh mentioned the painting in a letter to Theo on 20 September 1889, referring to it as a night study which was included in a list of paintings he was sending to his brother in Paris. When Gauguin was in Arles, I once or twice allowed myself to be led astray into abstraction, as you know. . . . But that was delusion, dear friend, and one soon comes up against a brick wall. . . . And yet, once again I allowed myself to be led astray into reaching for stars that are too big—another failure—and I have had my fill of that. Regardless of this impression of the expressionistic swirls which dominate the upper portion of The Starry Night, the artist stated a year later in a letter to painter Émile Bernard that the painting had been a failure. Various scholars have closely examined The Starry Night, and some of them interpreted the painting as a hallucinatory vision. For example, an art historian Meyer Schapiro emphasizes that the painting was created as a visionary image inspired by a spiritual sentiment, and he suggests “the hidden content of the work” and makes a reference to the New Testament book of Revelation. Renowned art history figure Sven Loevgren claims that “the painting was conceived in a state of great agitation”, and characterizes The Starry Night as an infinitely expressive picture which symbolizes the final absorption of the artist by the cosmos. In July 1889, van Gogh suffered from the second breakdown in a period of seven months. Art historian Albert Boime underlines that the painting shows not only the topographical elements from van Gogh’s asylum window view but also the celestial elements, since not only Venus is represented but also the whole constellation Aries. 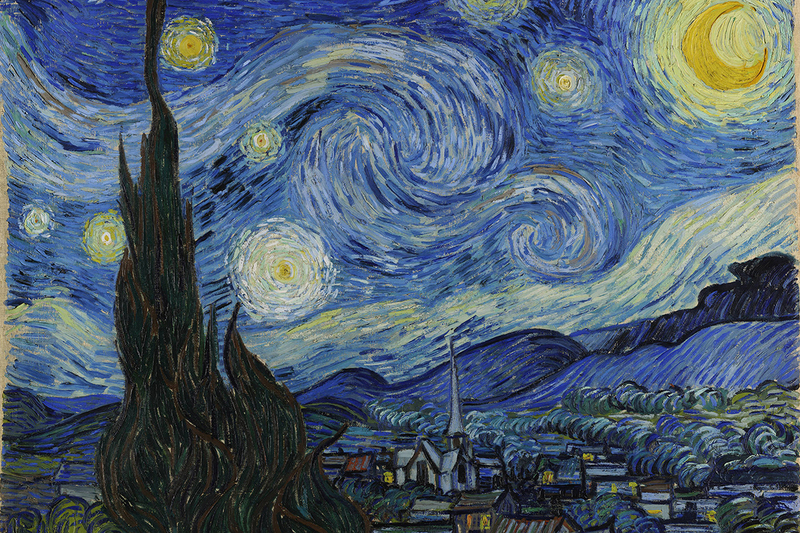 The influence of the writings of Victor Hugo and Jules Verne is apparent in The Starry Night suggests Boime as well as van Gogh’s apparent interest in an afterlife taking place in a form of stars or planets. On 28 September 1889, van Gogh sent The Starry Night with other nine paintings to Theo in Paris, although he initially wanted to keep it next to him. In January 1891 Theo passed away, just six months after Vincent, so his widow inherited van Gogh’s legacy and sold the painting nine years later to poet Julien Leclercq in Paris who finally sold it in 1901 to Émile Schuffenecker, Gauguin’s old friend. 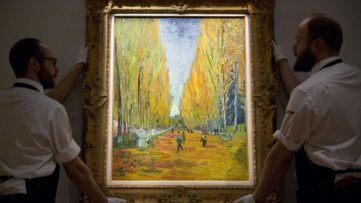 Theo van Gogh’s widow decided to get back The Starry Night and sold it once again to the Oldenzeel Gallery in Rotterdam in 1906. It was then in the hands of Georgette P. van Stolk from Rotterdam possessed until 1938, when it was sold to American Paul Rosenberg from whom MoMA acquired this mysterious masterpiece in 1941. The Starry Night was later examined thoroughly by the conservators from the museum and the Rochester Institute of Technology. 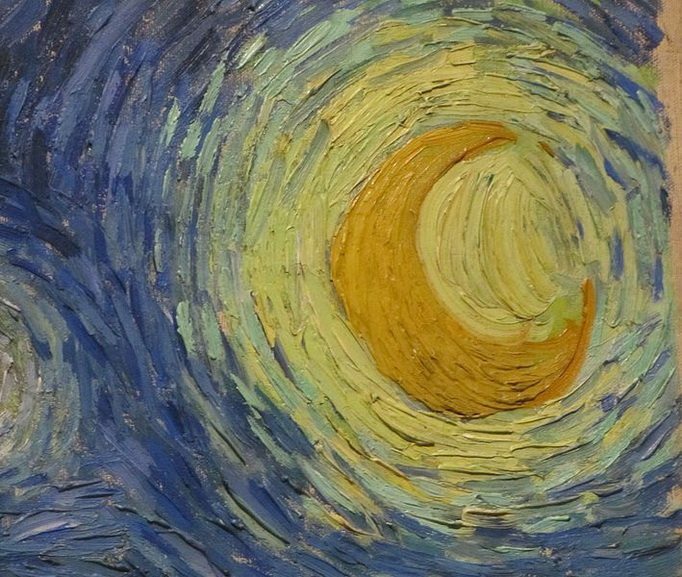 The analysis showed that van Gogh used ultramarine and cobalt blue to paint the sky and rare Indian yellow together with zinc yellow pigment for the moon and the stars. As it was already mentioned, the domains of this painting are huge, so it is not a wonder that it still sparks such an amazement. It profoundly influenced later generations of the Fauves and German Expressionists, since its pictorial aspects were incorporated by the proponents of these movements. 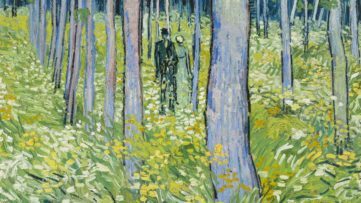 Van Gogh is celebrated as a tragic figure who suffered greatly, so naturally, he embodies the romantic ideal of the tortured artist. During his lifetime he was unable to sell one single painting and remained anonymous, yet his masterpieces are being sold on auctions for outstanding sums and The Starry Night became an iconic work of modern art and has been an still is being reproduced on various merchandise. The artist was undoubtedly an innovator who changed the image of modern times and even in the contemporary moment of digitized experience, we can understand the symbolic context of uncertainty and solitude surrounding The Starry Night. Starry Night is a fully illustrated account of van Gogh’s time at the asylum in Saint-Rémy. Despite the challenges of ill health and asylum life, van Gogh continued to produce a series of masterpieces – cypresses, wheatfields, olive groves and sunsets. He wrote very little about the asylum in letters to his brother Theo, so this book sets out to give an impression of daily life behind the walls of the asylum of Saint-Paul-de-Mausole and looks at van Gogh through fresh eyes, with newly discovered material. 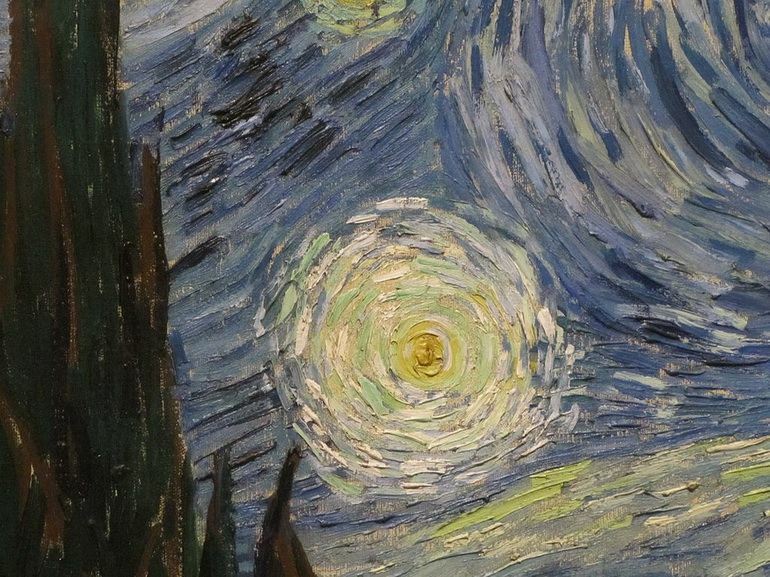 Featured image: Vincent van Gogh – The Starry Night, 1889, detail. All images creative commons.